Lit and Laundry: Vintage Thingies Thursday: Baby It's Cold Outside! Vintage Thingies Thursday: Baby It's Cold Outside! I'm sure this is very politically incorrect these days, but I do love this coat with a mink collar. I inherited it from an Aunt, and I'm not sure when she got it. It's camel color with 3/4 sleeves and warm as toast. The buttons are enormous. I love the whole boxy shape of it. Vintage Thingies Thursday has a new home! It is now hosted by Coloradolady. Pop on over and see what everyone's showing off. Don't forget to join me tomorrow for "Finished for Friday!" I think the coat in environmentally very correct: after the minks stopped wearing their fur it ended up in aunt's collar, and now you are wearing it. Durable and warm and very pretty too. 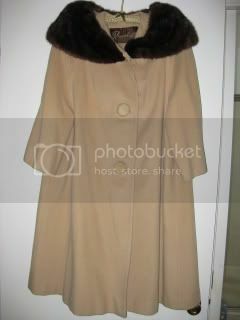 My mom had a coat like this! It was off white with the white collar, I hated that thing as a kid, I thought it was weird looking....now, I wish I only knew what happened to it. It looks like yours is in great shape. If you tried to like to my VTT link, I had a bit of trouble with it this morning. Sorry. I am new to that feature. You can try and link back again to the post. I will get this worked out. Looks so toasty! I'm not quite sure why my work thinks its still August but they seem to think having the A/C on full blast is a good idea... and I'm freezing! I wish I was wearing that coat. LOL! OH my goodness! I think my mom, my grandma and my great-grandma all had one of these! Thanks for the memory! And who cares about being politically correct! My mom and aunt had coats like that! Love the look of them! I think this coat is from the early 60s. My mom has the same one! oooo.. I love it. Is is wool? I love that coat! And, thanks for the update on VTT. I saw Suzanne had volunteered to host it but didn't know when she would start. Oh and on my little house, it's my sewing, and not the stuffing. Trust me on that. I think I need to learn how to use a machine because my hand sewing is terrible. How did YOU end up with my Aunt Kate's coat? Your coat looks lovely, very classic. My mother has a vintage coat with monkey fur of all things. I know it's not PC but it does look fabulous. Look at those great buttons - I'm rather fond of buttons! If the coat was made before political correctness came into vogue, I think it should be exempt. Once I had 3 children under 2 years old. Now they are all teenagers. I'm writing this blog so I can look back at my life and say "It was crazy, wasn't it? But great, and full of love." Lit and Laundry by threeundertwo is licensed under a Creative Commons Attribution-No Derivative Works 3.0 United States License.